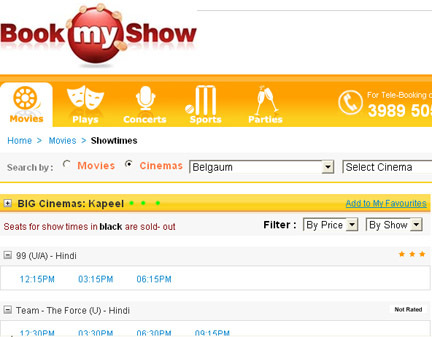 Now you can even book your tickets to your favourite movie in Big Cinemas Kapeel (Nucleus Mall) by logging into http://www.bookmyshow.com as well. You pay Rs.15 additional as convenience charge that is it. On the Big Cinemas site you have to shell Rs.10 extra per ticket. Its convenient indeed. But did you know you can book the BIG Cinemas Kapeel tickets from your phone?? SMS “ngpay” to 56767. You will receive a SMS from ngpay containing a link to download an application. Select the link and follow the instructions to download and install. Once downloaded, you will be able to find BIG Cinemas in the Entertainment section and then select Belgaum. You will see the movie listings and in another 2-3 clicks you can book tickets! Isn’t that easy? Given that ~70% of the population of Belgaum will have mobiles compared to getting a computer with internet connection! Surely a nice thought and thanks for sharing that info. Prior it was available. But again in between they stopped online booking.. Dunno wat was the reason.. Now its back again.